Los Angeles, the City of Angels, home to Hollywood, the biggest giant of the entertainment industry — is a place full of glamour and fun without end. The city has a vast array of landmarks and buildings worth visiting, even though it is a new city on a greater historical scale. Although bars seem not to be the places where one would search for history, some Hollywood bars are nothing short of historical monuments. Besides being used for fun, they are the birthplaces of many novels, stars and scripts. Bar Marmont is a part of Chateau Marmont, a hotel built by the famous William Douglas Lee and opened in 1929. 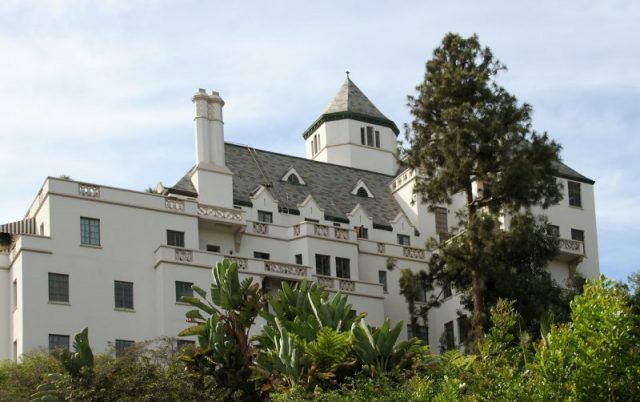 It is a place where literary giants such as F. Scott Fitzgerald stayed; where many Hollywood couples had their affairs in the elevators and hallways; and where the whole of Led Zeppelin drove through the lobby on their motorcycles. Most importantly, the hotel and the bar have a politics of silence, never disclosing the mischievous behavior of their guests. 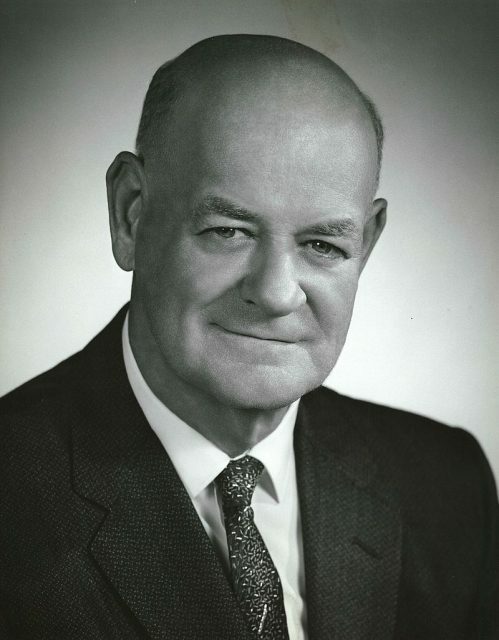 That is why Harry Cohn advised William Holden and Glenn Ford: “If you must get into trouble, do it at the Chateau Marmont,” as the Smithsonian reports. 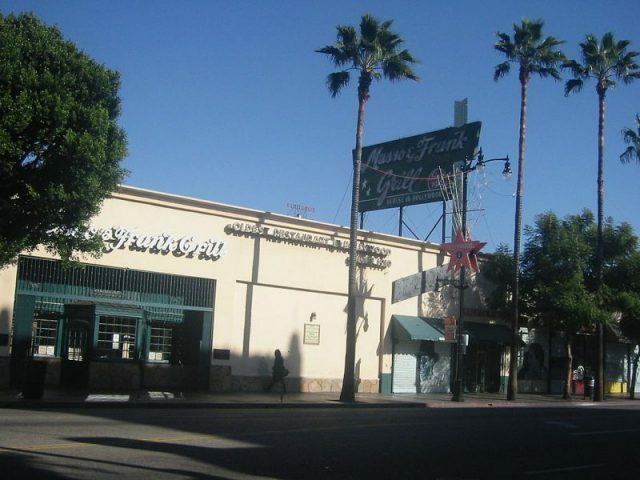 Musso and Frank, opened in 1919, was a place where giants such Marilyn Monroe and Charlie Chaplin would lounge on the cozy leather banquettes or stand at the long mahogany bar. The bar is famous as the place where the first pay phone in Hollywood was installed, but most importantly for its martini’s. The guests are attended by waiters dressed in red jackets and black bow-ties, exactly the way they were when famous Hollywood luminaries would hang around. Manny, a bartender working there since 1989, makes the classic martini, believed to be the best in the world. The Polo Lounge is a part of the Beverly Hills Hotel that was built in 1912, preceding the actual city. From then on it was a crucial part of its soul. The place still retains its Hollywood mystique of yesteryear and is famous for its original cocktails. 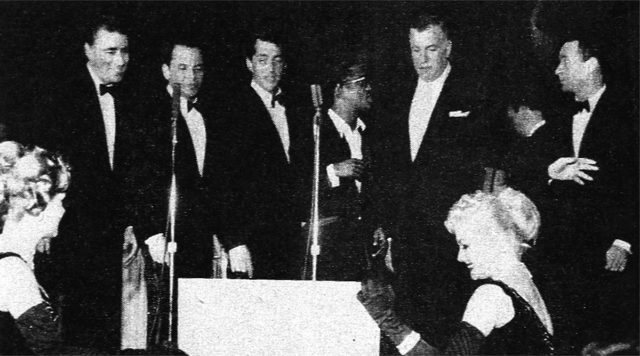 The Rat Pack with Jack Entratter at the Sands, 1960. The Rat Pack were regulars at The Polo Lounge, while John Lennon was also a regular seeking a quiet place for him and his lover Yoko Ono. Tom Bergin’s Tavern in Los Angeles, California, looking north on Fairfax Avenue. 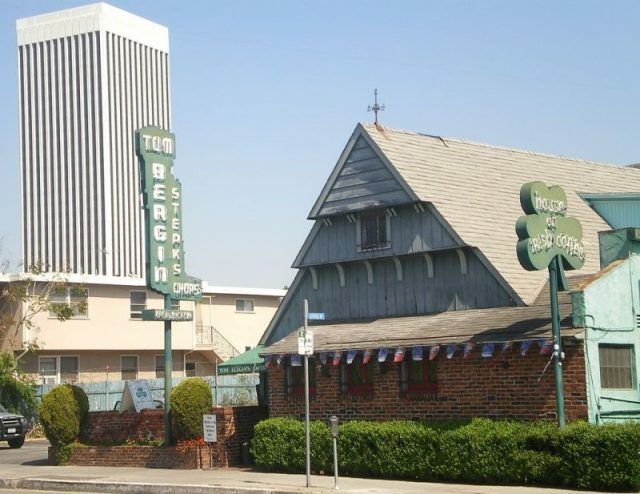 Tom Bergin’s was opened in 1936 on Wilshire Boulevard under the name of Horseshoe Tavern & Thoroughbred Club. It is famous for its Irish Coffee and its walls are clad with shamrocks bearing the name of famous visitors, including John Wayne, Julia Roberts and Ronald Reagan. 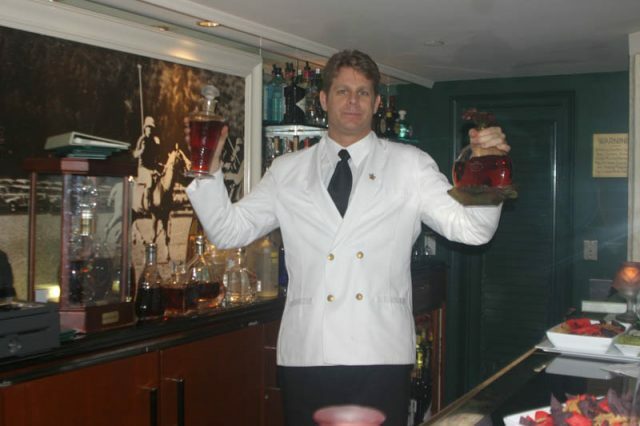 Interestingly, it is believed that Tom Bergin, the founder of the bar, still haunts it and that the employees can hear him calling their name. Many have also said they can smell cigarette smoke beside his barstool long after smoking was banned in L.A. The bar later moved to the location at Fairfax with the Los Angeles County Museum of Art standing on its old plot. The Frolic Room, with its insinuating name, opened on Hollywood Boulevard as a speakeasy in 1930 with prohibition still in place. In 1934 it exited the shadows and became legal. From 1949, when Howard Hughes bought the Pantages Theater, until 1954, the Oscars after-party was regularly thrown in the Frolic Room. 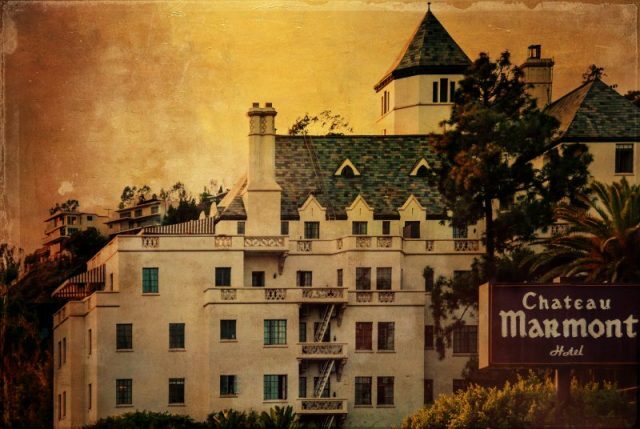 Its walls bear the history of many happy moments for the famous, and Sinatra and Judy Garland were the regular guests. However, there is one sinister fact connected to the bar and that is the fact that Elizabeth Short, or Black Dahlia, was seen in the bar for the last time before her brutal demise.